We’d love your help. Let us know what’s wrong with this preview of King by R.J. Larson. Against his wishes and desires, Akabe Garric has been chosen by his people to be king. A warrior at heart, he'd never dreamed of such a swift, unexpected rise to power. Determined to prove his worth to the citizens of Munra and honor his Creator, Akabe undertakes a monumental task: to rebuild the Akabe of Siphra, I have brought your enemies low and lifted you from the dirt. A satisfying conclusion to the BOOKS OF THE INFINITE series by R.J. Larson! I really enjoyed getting back to Ela, Kien, and Akabe and their adventures. This book was once again suspenseful, adventurous, sweet, and very deep; just like Prophet and Judge before it. I simply love the mixture of Christian fantasy and Old Testament-like times ... where prophets, judges, and kings (who sometimes make you think of specific Bible stories) roam ... that make up these books. It's a fascinating combination A satisfying conclusion to the BOOKS OF THE INFINITE series by R.J. Larson! I really enjoyed getting back to Ela, Kien, and Akabe and their adventures. This book was once again suspenseful, adventurous, sweet, and very deep; just like Prophet and Judge before it. I simply love the mixture of Christian fantasy and Old Testament-like times ... where prophets, judges, and kings (who sometimes make you think of specific Bible stories) roam ... that make up these books. It's a fascinating combination! It all ends as it should! A satisfying conclusion to an excellent series. Who doesn't love a girl with a powerful stick?! And the horse Pet is always a delight. What I like best about this though is the way God speaks - I know this God and love that He is depicted so accurately in this Old Testament-style epic adventure. Despite being a reluctant king, Akabe of Siphra strives to do something honorable: rebuild the Infinite's temple. But when his plans are disrupted by the Atean owner of the temple land, Akabe makes a rash decision without getting the Infinite's approval. This leads to one catastrophe after another, putting Akabe and some of the people he loves most in grave danger. Will his actions destroy himself, his friends, and Siphra? Like the other books, King was full of more dangerous adventures. Akabe is now a main character, and we get to know (and love) him more! :) Our dearest Kien and Ela continue as main characters as well, which is a must! ;) Then there is a new character, Caitria, who I really liked. :) These four get into some very dangerous stuff as they confront assasins, Bel-Tygeon, battles, and the like! Thus, my not-very-well-written review! :P I hope it still prompted you to read The Books of the Infinite Series! :D I'm looking forward to reading more by R. J. Larson! recommended to: non-magical (besides the Infinite's power, which isn't magic) allegorical fantasy, adventure-lovers, and those who love dear characters! :D For ages, maybe I'd say, tentatively, 15+. I was so excited to finish out this series, and RJ Larson didn't disappoint. The final novel in this series is full of action. While it was a bit predictable and the ending, while good, was a bit anti-climatic, I still enjoyed experiencing this story along with the characters. Well, that was an interesting ending. I’ve now realized that though this is a series, each book could be a stand alone except for the fact that Ela and Kien’s relationship grows and changes as the stories progress. It was a good conclusion, but not what I expected. I just feel like it needed something more. Akabe Garric is now something he never wanted to be: king. He’s a warrior, and he has never faced the responsibilities of being king. To prove to himself and his people that he is up to the ta Well, that was an interesting ending. I’ve now realized that though this is a series, each book could be a stand alone except for the fact that Ela and Kien’s relationship grows and changes as the stories progress. It was a good conclusion, but not what I expected. I just feel like it needed something more. Akabe Garric is now something he never wanted to be: king. He’s a warrior, and he has never faced the responsibilities of being king. To prove to himself and his people that he is up to the task, he sets his sights on rebuilding the Holy House of Siphra. But if he wants the land he will have marry a worshipper of Atea, a idol. What should he do? The Infinite doesn’t answer. So Akabe makes a rash decision that sets off a course of events that may lead to the destruction of Siphra. Ela ponders over whether it is the Infinite’s will to marry Kien. Kien faces a trial that could lead to his exile. Ela faces more suffering and sadness, but she is stronger and has more confidence in the abilities the Infinite gave her. Kien is put through sadness, anxiety, and suffering unlike anything before, but he’s prepared to follow all of the Infinite’s commands. I must say, it felt like Ela and Kien’s relationship as friends to something more very quickly. It felt rushed. So I loved the direction it went, but I didn’t like how it was done. Akabe is probably my second favorite character after Kien. I was really happy to see more from his point of view. I connected with him well and I felt his struggle to make the right decisions. And I understood why he made the decisions he did, even if I didn’t necessarily agree. Caitria was a great new character that I loved from the beginning. She is shy and afraid at first, but she develops so much to become the lady who can handle the responsibilities she’s given. The book moved very fast. From one moment to the next, the characters were always in danger. There were assassins, battles where the characters were way outnumbered, kidnappings, and more. It was certainly not boring. For me the ending just wasn’t very satisfying. It was good, everything was resolved amazingly, but I felt that there was something missing. But maybe it was meant to be that way. In every book, at least some of there characters visit a new place. This book visited Aeyrievale and Belaal. It was refreshing and fun to see how unique each place is. The descriptions were really well done. It was easy to imagine. I’ll recommend this to older teens. It is a beautiful allegorical book with a fantasy feel. I don’t think this allegory is my type of thing, but don’t dismiss this book because of me. Give it try, you won’t regret it. After finishing Judge, I was very eager for the last installment, and it certainly did not disappoint! This time around, we're dealing with danger and intrigue in and around the royal court of Siphra and focusing on the journey of King Akabe as he tries to rebuild the Infinite's ruined temple. I really enjoyed Akabe in the last book, particularly in his friendship with Kien, and that continues strong in this one. (view spoiler)[And although I wanted to bury my head when he first expressed interes After finishing Judge, I was very eager for the last installment, and it certainly did not disappoint! This time around, we're dealing with danger and intrigue in and around the royal court of Siphra and focusing on the journey of King Akabe as he tries to rebuild the Infinite's ruined temple. I really enjoyed Akabe in the last book, particularly in his friendship with Kien, and that continues strong in this one. (view spoiler)[And although I wanted to bury my head when he first expressed interest in Ela, his reaction when he found out who she loved absolutely floored me. Oh, my word--that is a serious friend! (hide spoiler)] I can definitely sympathize with his longing to be free of all the advisers and meetings and other trappings that came along with his new kingly role. And the subtle reminder that pride can creep in when we start trying to prove ourselves worthy in our own strength was definitely on point. There were a lot fewer overt biblical parallels in this installment, mostly glimmers here and there with only one or two really recognizable situations. But the messages of the Creator's love, mercy, and judgment were as strong as ever. Though I have to admit, I just about got whiplash at one point in the epilogue! The action and suspense were kept up very nicely through the whole thing, too. Definitely a solid and satisfying conclusion to a very unique series! I truly do not remember what this book was about. I do remember reading it but not sure how it goes anymore. That one thing I like about me I can read a book and still enjoy it over and over. When it good, I do this. This book was good to me. I know it about a boy either to become king or something like that. He is either to save a kingdom or something. I am sorry I can not remember. The overall of the book is good and fun to read. This is best for those of a favorite of fantasy. Akabe is the Infinite's chosen king to rule the people of Siphra. He doesn't feel that he should be king, but he wants to honor the Infinite and rebuild His Temple. His advisers clamor for him to marry and the only woman he feels would be a great queen is Ela of Parne, the Infinite's Prophet. Ela firmly believes that she will never marry, even though she loves Kien Lantec. Though she refuses the king's request, she follows the Infinite's will and marries the man she loves. The king marries a mys Akabe is the Infinite's chosen king to rule the people of Siphra. He doesn't feel that he should be king, but he wants to honor the Infinite and rebuild His Temple. His advisers clamor for him to marry and the only woman he feels would be a great queen is Ela of Parne, the Infinite's Prophet. Ela firmly believes that she will never marry, even though she loves Kien Lantec. Though she refuses the king's request, she follows the Infinite's will and marries the man she loves. The king marries a mysterious young woman who may be a threat to both his reign and to the Temple. When assassins attempt to kill the king multiple times, Akabe, along with the queen and friends Kien and Ela Lantec, go into hiding at the far ends of the kingdom. Yet even there, danger lurks. When the women are taken captive, will Akabe and Kien obey the Infinite and stay where they are or will they risk everything for the women they love? And will Ela and the queen follow the Infinite's orders to speak the truth no matter what may happen? This is the conclusion to the Books of the Infinite Series. I've enjoyed both Prophet and Judge and was really looking forward to reading King. While I thought that Judge moved rather slowly, I was eager to delve into King. I was not disappointed in this book. Once again a mix of Old Testament prophets (I recognized some of Moses, some Samuel) as well as Old Testament kings (mainly David and Solomon) fill the pages of the book. My favorite character is still the destroyer-horse, Pet/Scythe, but the rest of the characters were engaging as well. I was thrilled to see that Ela and Kien finally got their happily ever after. And the storyline of the king and queen kept me reading to the end. I think of the three books in this series, this is the best, and my favorite. I received this book for free from Bethany House Publishers for the purpose of reviewing. My thoughts and opinions are my own. This is the third book in this series but is great as a standalone! I was taken in by the story right away and loved it! It also helped that there's a Character List at the beginning so if I wasn't sure who someone was, I could refer back to that to see who they were and how to pronounce their name. The Prophet Ela has anointed Akabe to be king of Siphra at the Infinite's command. Akabe starts working to rebuild the temple. His council advises him that he needs to marry to produce an heir. He's s This is the third book in this series but is great as a standalone! I was taken in by the story right away and loved it! It also helped that there's a Character List at the beginning so if I wasn't sure who someone was, I could refer back to that to see who they were and how to pronounce their name. The Prophet Ela has anointed Akabe to be king of Siphra at the Infinite's command. Akabe starts working to rebuild the temple. His council advises him that he needs to marry to produce an heir. He's surprised by this and then decides that he will ask Ela. Cyan Thaenfall has agreed to sell the land where the temple needs to be built to Siphra but when the signed offer is returned to the king, it's been burned and Akabe wants to meet with Thaenfall in person because they need to acquire the land. Ela has her reasons for not wanting to marry the king and Thaenfall has new demands on Akabe before he'll sell him the land. There is romance, adventure, friendship, betrayal, inspiration and learning to listen to and obey a higher power even when what's asked seems impossible. They don't always obey and suffer the consequences for their choices. I enjoyed getting to know the characters and watching their growth as the story progressed. They each had challenges to overcome and turned to the Infinite for answers. Sometimes they received the answers they needed and sometimes they didn't so they had to keep going with what they felt was the best option. They also learned the best way to deal with their enemies and tried to see them as the Infinite does. This is a well written book with lots of great quotes and thoughts. I found myself stopping a lot to digest the words I had just read. I loved the ending and this is a book that I highly recommend!! When I accepted this book for review, I didn't realize that it was the third book in a series. I noticed that the cover looked compelling and the synopsis was interesting. I began to read and found myself caught up in the story. R.J. Larson does such a good job of explanation and laying her groundwork, that I didn't miss reading the first two books before starting this one. I am, however, interested in reading the first two. Akabe is a young king. He did not aspire to the throne of Siphra, but fou When I accepted this book for review, I didn't realize that it was the third book in a series. I noticed that the cover looked compelling and the synopsis was interesting. Akabe is a young king. He did not aspire to the throne of Siphra, but found himself in the position regardless. He is faced with court intrigue and an enemy who would love to see him dead. He has a strong belief in the Infinite and seeks to do His bidding. As one of his first projects, he wants to rebuild the temple that was destroyed. His dream almost comes to an abrupt end when the deal begins to unravel. He barters for the sacred temple land and finds himself with a wife from a different culture and religion. Somehow the young King must find a balance between his country, his marriage, his faith, and his friends. He must figure out how to keep hold of his struggling country and stay true to his creator. I found this book to be fascinating. I honestly enjoy reading book that hold religious content. I love reading about different societies and structures. I found many situations that reminded me of the bible. The rebuilding of a sacred temple, the builder doing it without seeking God's will, but doing it for his legacy. The prophet is a young woman by the name of Ela. In the old testament, El denotes God. I do not know if R.J. Larson intentionally added these elements or if it was a coincidence, but it was fun for me to pick them out. The awesome conclusion of a wonderful fantasy series that will definitely end up on my favorites shelf. Larson creates wonderful characters full of charm and courage as well as faith. The settings are vivid and integrated into the story beautifully. The connections to events from the Old Testament were clear but didn't interfere with the uniqueness of the story. My favorite parts were definitely the interactions between Ela, the Infinite's prophet, and Kien, an Ambassador turned prisoner. Ela was The awesome conclusion of a wonderful fantasy series that will definitely end up on my favorites shelf. Larson creates wonderful characters full of charm and courage as well as faith. The settings are vivid and integrated into the story beautifully. The connections to events from the Old Testament were clear but didn't interfere with the uniqueness of the story. My favorite parts were definitely the interactions between Ela, the Infinite's prophet, and Kien, an Ambassador turned prisoner. Ela was easy to care about and relate to in her struggles to do as her god instructed despite her own personal flaws. Kien, a charming and honorable rogue made me smile whenever I read about him. How could Ela resist him? And yet she feels she must in order to keep her promises to the Infinite, but the Infinite doesn't reveal all his plans to Ela all at once and it is quite the journey. In King, the story focuses specifically on Akabe, a warrior turned king, who has no idea how to be one. Seeking the Infinite's guidance and the support of Ela and Kien, he sets forth to rebuild the Infinite's Holy Temple. But as any king quickly discovers, politics can never be overlooked even when it comes to religion and he must face uncertainty as well as betrayal. Can we follow God in faith even when he seems silent to our prayers? This is something that we often struggle with and that Larson approaches in her newest novel, King. For me, the lessons of this novel are much more applicable to my life and I enjoyed that aspect. As to the story itself, the beginning seemed slow. It was a good portion of the book before the action began. While somethings happened in this part that I had been waiting for since book one, they seemed either too drawn out or too rushed. I really enjoyed all three books in this series. The author incorporates Old Testament happenings into her own fictional account. Many lose their lives in war ,but in the end, the righteous are exalted. Ela is boldly prophesies in this book, the Infinite shows up to prove His words. Love stories are woven in the midst if it all. I just loved this series! This was a great final book and wrap-up. Inspirational, too. Because of the slow beginning and the scenario seemed too familiar with the struggle, I found this complete but had me tabling it instead of glued to the story. Kien remains my favorite character. Akabe Garric has been chosen, against his will, to be king of Siphra. He's a warrior at heart and never dreamed if or wanted such a swift unexpected rise to power. Despite his misgivings about his new role, he's determined to prove his worth to the people of Munra and honor his Creator by undertaking a monumental task: rebuilding the Infinite's Holy House in Siphra. If only the task only was all he had to worry about. When Akabe soon discovers that the land he needs is held by the ThaenFalls, known Atea-worshipers who will only give him the land if he marries into their line. He has no idea what to do, all he knows is that his choice, Caitria, is pretty and seems like she's had a rough life like him. Though Akabe seeks the Infinite's direction, he gets nothing but silence. Frustrated, Akabe makes an impulsive decision which sweeps his nation into a lethal storm that threatens his plans for the temple. With Akabe's impulsive marriage to a controversial bride, Ela and Kien are forced to face what they feel for each other and when her father gives her to Kien, she must face her fears of her lifespan and those she'll now leave behind. They also must face assassination attempts and another vision that will forever alter their lives as well as make them question how much time they have left. They must team up for righteousness and to survive but their enemies are persistent and they might finally succeed in killing the world famous prophet. Can Ela give up her fears for her death and her fears of who she will leave behind or will she forever refuse to love because of the unknown? Can Akabe turn his new wife to the Infinite or will he have a wife who hates his Creator forever? Can Kien, Akabe, Caitria, and Ela survive the assassins or will the assassins succeed in their task? Will Akabe and Caitria fall in love despite their differences or will they forever be unhappy in their situation? Can Akabe finish the Infinite's Holy House or will he lose his life because of it and before it's finished? I love this author and her first fantasy series. This series is absolutely incredible and this latest installment skyrockets it up to my "top five best series ever" list and it's not coming off any time soon. I'm a bit sad it has to come to an end yet excited to find out what other fantastic fantasy novels she will throw my way. R. J. Larson has become one my all time favorite authors and I fully intend to attempt to he my hands on anything else she writes. Each book in this series was slightly different. The first focused on Ela and mostly revolved on prophesy, while the second revolved around battles and stubbornness. This one, revolved around love, survival, and trusting God and I must say that I think this one just might be my favorite of the three. This book hit close to home because I find myself doing things similar to King Akabe and so I loved this one and seeing every lovable character's ending. and I couldn't help but love her despite some poor choice and wrinkles in the road. The one thing I wish was a bit different was the lack of an intense "death-scene" for our prophet, Ela. In the other two books, Ela has nearly died and the intensity of those scenes and the feelings they evoke was greatly missed and gave the book a less urgent feeling that I feel would've worked nicely. Also, a small pet peeve, I really wanted to know how long Ela lived for but I guess that that is something the author didn't want us to know. This author truly captivated me and made me a huge fan. I'm eagerly anticipating the next book she authors and hope that I'm fortunate enough to get my hands on it. I don't think I've this fully engrossed in a book in a long time, nor have I wanted something to be real as much as I've wanted my own destroyer. This author mastered this series and has a definite gift of storytelling. This author and series come highly recommended. Overall, I really enjoyed this book despite the lack of intensity and finality with Ela. I think this this book is perfect for people who like a fantasy that feels real. I think this series is great for adults, teens, and tweens and will help develop their love of Christ. I give this book a four and a half out of five. King is the third and final installment in the Books of the Infinite series by R. J. Larson. Readers see the close relationship between the Infinite and His Prophet, Ela, deepen as well as with His Judge, Kien. These are the focus of the first two books in the series, respectively. I’m looking forward to more novels from this author, and I encourage you to read this series. You won’t regret it. The Prophet, Ela, is now married to Kien Lantec. Kien has been exiled from his homeland and has been made a citizen and lord in Siphra by King Akabe. Ela is still a target for assassination by the Ateans as she is the Infinite’s servant. They think the Infinite is not real. She receives revelations of the future from him as well as power. She is completely dedicated to him. She serves King Akabe on an earthly level. Ela and Kien are summoned from their new land and holdings by the King. They travel back to the capital of Siphra and learn of three different assassination attempts on the King by Ateans related to his new queen. It is decided that the King, Ela, Kien and his new wife along with some guards will leave the capital until the assassins are captured and security improved. King Akabe thinks he must marry to obtain a certain piece of land to rebuild the Infinite’s temple. He must marry an Atean and she is definitely not a believer in the Infinite, but how dedicated is she to her goddess? She is young and alone in Siphra and has been treated badly by her family. Can she open her heart to her new husband and The One he worships? The King foils the assassination attempts while trying to figure out his new wife. Does she have any feelings for him? He thinks it is possible they can have a true marriage, not the one they were forced into. The King has it revealed to him that in his pride to be the one to rebuild the temple and thus marrying an unbeliever, he has not followed the Infinite’s will for him. This is an exciting adventure to wrap up the series. There is action, love, plotting and scheming, hostages taken and unbelievers dying. There is never a dull moment in this book, which is one reason I liked it. The characters have matured and grown so much in their faith since the first book. The ability of them to stand and serve and obey the Infinite when in terrifying situations is admirable. I so enjoyed the conversations that took place between the Infinite and Ela. She is so young physically at 19 years of age, but so grounded in her faith and service. What an inspiration! Forgiveness is extended to those undeserving just like our Father forgives us when we ask with a broken and contrite heart in true repentance. This book is a great conclusion to the whole series, which I recommend. In this third installment to the Books of the Infinite series, R.J. Larson seems to hit her stride as a fantasy author. As with JUDGE, the novel shifts focus to another character, this time King Akabe. Kien and Ela are still prominent, but more subdued in their overall roles. The humor we have come to expect with such characters as the monster destroyer horse “Pet” (Scythe) is likewise there, but downplayed. I think I enjoyed this novel more than its immediate predecessor for a couple of reasons In this third installment to the Books of the Infinite series, R.J. Larson seems to hit her stride as a fantasy author. As with JUDGE, the novel shifts focus to another character, this time King Akabe. Kien and Ela are still prominent, but more subdued in their overall roles. The humor we have come to expect with such characters as the monster destroyer horse “Pet” (Scythe) is likewise there, but downplayed. I think I enjoyed this novel more than its immediate predecessor for a couple of reasons. First of all, I could identify a great deal more with Akabe than I could with Kien, likable as that character was. All of the characters are naturally flawed, but Akabe perhaps more relatably so. His decisions tend to end up with less predictable outcomes, particularly in the romance department. He is a man who tries his best, and is not always immediately rewarded with success for his efforts. Moreover, not having the direct connection with the voice of the Infinite that Ela and Kien do, he feels a bit more like the Everyman. (While it is refreshing in many ways to read of characters who rely upon God for everything, the constant punctuation of every one of their thoughts with “Infinite?” did tend to get slightly redundant, particularly in the second volume.) That is not to say that he is not a loyal follower; quite to the contrary. He perseveres when many would give up, particularly in the face of assassination attempts and what appears to be a hostile marriage. His living by principle, even in the absence of direct guidance from his creator, is refreshing. Larson demonstrates through these books that heroes can be just as interesting as antiheroes, and there is nothing boring about good people trying to do right (it’s harder than people these days seem to think). While I am glad that my predicted ending did not come to pass, the central premise of the first book seems to be a bit glossed over by the end of the third (though I will not give spoilers regarding characters fates, the setup and themes of the first two books led me to believe that perhaps things would turn out less than happily-ever-after). Because of all of the setup it got, and how much it affected the decisions made throughout the series, I think I expected it to be addressed with a little more strength. On the other hand, a more open-ended approach did allow for a fairly satisfying ending to the story, and certainly there is room for sequels in Larson’s quasi-biblical fantasy world. I would welcome more stories told in this idiom, including perhaps a rewrite of her Genesis trilogy (though I balked a bit at the idea at first, being fond of that series for its own strengths). It would be interesting to see some of the biblical stories shuffled a bit chronologically for the altered history of this world. I have read several great books in the Fantasy genre lately, and one in the Christian Fantasy genre that I loved (The Hero's Lot). When I signed up for this tour, it was because I loved the cover and the summary. There is quite a lot going on in this story. You have several different key players and plots and circumstances, some of which have built up as the series has progressed. You would think that since there have been so many signs or proof of who Ela is and who she serves that there wouldn I have read several great books in the Fantasy genre lately, and one in the Christian Fantasy genre that I loved (The Hero's Lot). When I signed up for this tour, it was because I loved the cover and the summary. There is quite a lot going on in this story. You have several different key players and plots and circumstances, some of which have built up as the series has progressed. You would think that since there have been so many signs or proof of who Ela is and who she serves that there wouldn't still be so many doubts, issues, and hatred, but there is. You would also think that Ela, the king, and those surrounding them would be safe, but they aren't. Not even close and things escalate quite quickly when the king takes a wife who is not of the same faith. You can see a lot of similarities or situations based off of different Bible stories. The circumstances and resolutions are not the same though. This is a different world with different characters and other factors, such as the different monsters found in the land. It was interesting how the author might incorporate something that could be construed as scripture based, but still made it her own story. I did feel that the religious context was pretty strong, stronger than I like. The writing could have been a little smoother as well. Some things didn't always work for me either, but I understood where the author was going and what she was trying to show. I also liked how she portrayed Ela's Creator in some ways, in his humor, understanding, love, and that anyone could hear his voice if they believed. I did like the characters. Akabe, who this story is really about - as he is trying to lead and restore his country, is a great king and character. Ela is still trying to figure things out. She is a prophet, but the Infinite doesn't tell her everything to do and think. She has to make some of her own choices. She is still trying to avoid marriage even though she loves Kien. There is quite a bit of history there. I also really like Kien. He loves his home land, Ela, and Akabe and would do anything for them. I also thought that Caitria was an interesting character and adds a good dimension to the story and the other characters. The story is constantly moving. You go from one - or a set of characters - to another depending on what is going on. You have one group, be it rebels, another country, or the king's councilors that pull the story one way or another or prompt certain events. Someone is always at risk at one point or another. It does slowly climax, but it felt more like several climaxes throughout the story. Overall, this was a good ending to the series. Source: Copy from tour host, which did not affect my review in any way. First, let me say that I seldom read YA fiction—and never speculative. However, R.J. Larson's ability to weave Old Testament tales with imaginary kingdoms and lovable monster-horses has been an incredible journey that I’ve enjoyed immensely. Book #1 of the series, Prophet, introduced us to Ela of Parne, a young girl charged with the huge task of speaking the Infinite's message to whomever whenever He commanded. Also in that first offering, we met Kien Lantec, a spoiled and brash nobleman who matu First, let me say that I seldom read YA fiction—and never speculative. However, R.J. Larson's ability to weave Old Testament tales with imaginary kingdoms and lovable monster-horses has been an incredible journey that I’ve enjoyed immensely. Book #1 of the series, Prophet, introduced us to Ela of Parne, a young girl charged with the huge task of speaking the Infinite's message to whomever whenever He commanded. Also in that first offering, we met Kien Lantec, a spoiled and brash nobleman who matured through suffering and became the main character of Judge, Book #2 of the series. Now, in Book #3, we meet a friend of both Kien and Ela's, King Akabe, who finds himself in a circumstance similar to that of one of the Old Testament kings. Akabe of Siphra never wanted to be king in the first place. QUICK! Can you think of an Old Testament king that was crowned unwillingly? Give up? Check out 1 Samuel 10, and there may be others. Prophet, Judge, and King use subtle Old Testament inferences to keep Bible-lovers alert for golden threads of biblical stories woven throughout. Each book is a biblical treasure hunt, challenging the reader to apply scriptural truths in a make-believe world that then translates meaning into our daily lives. Why make-believe? Why fantasy? Larson’s kingdoms of Siphra and Parne seem quite Victorian, and though some of the woodland and desert “creatures” are most definitely speculative, they’re used appropriately for the lessons being taught and learned. The best reason I’ve discovered for reading speculative fiction? Because when I see a concept at its barest level, without real life complications, I can then apply it more effectively to my life. Applying biblical principles to a completely fictional circumstance allows me to focus more keenly on the principle. Akabe Garric is now the unwilling king of Siphra, looking to rebuild the Infinite’s temple. However, on the first day of construction, the deal with the landowner of the temple site goes south and Akabe is forced to negotiate new terms. Lord Thaenfall, a known Atean and enemy to the Infinite, insists that the only way he will sell the land is if the King marries his daughter. Akabe makes a brash decision and soon finds himself and his new wife Caitria the targets of many assassination attempts b Akabe Garric is now the unwilling king of Siphra, looking to rebuild the Infinite’s temple. However, on the first day of construction, the deal with the landowner of the temple site goes south and Akabe is forced to negotiate new terms. Lord Thaenfall, a known Atean and enemy to the Infinite, insists that the only way he will sell the land is if the King marries his daughter. Akabe makes a brash decision and soon finds himself and his new wife Caitria the targets of many assassination attempts by Atean rebels. Along the way the King and Queen receive some help from their friends Ela, prophet of the Infinite and Kien, now exiled from his home in the Tracelands. Can Akabe and Caitria weather the onslaught of Atean rebels and find true love despite their differences? King was a fantastic ending to a well loved series! I enjoyed delving deeper into Akabe’s character as well and discovering a wonderful new addition to the series in Queen Caitria. Afterall the harsh treatment and abandonment from her family, Caitria cannot help but be suspicious of other and a little cold. It was wonderful to watch her come out of her shell and warm to Akabe and their friends. Fans of Ela and Kien (like myself) will be extremely pleased with the direction their relationship goes in this book! The biblical references were fun to pick out while the author still managed to make the story its own. Last, but certainly not least, is Scythe (a.k.a. Pet) the destroyer with a big attitude and an even bigger appetite. Scythe dolls out his regular amount of grumblings, all while fiercely protecting Kien and Ela, and his usual amount of destruction. Is their nothing this horse won’t eat! Unfortunately for Ela, an old friend decides to run for political office and his only hope of election is to return to her his own destroyer Flame, Scythe’s beloved, who is in a delicate condition (as if the word delicate and destroyer would ever go together in the same sentence). What will she and Kien do with a whole family of destroyers? This book has it all, romance, humor and action! I would definitely recommend it to others and am looking forward to more from this wonderful author! Though I can’t tell for sure, King appears to be the finale book in Larson’s “Books of the Infinite” series. Akabe Garric has been chosen as king, though he had not asked for kingship. Despite this, he decides to prove himself to be a worthy king and begins undertaking a major project: Rebuilding the Infinite’s temple in the land of Siphra. He quickly runs into a problem, that land is held by worshippers of another god and will only relinquish the land if Akabe marries their leader’s daughter. Though I can’t tell for sure, King appears to be the finale book in Larson’s “Books of the Infinite” series. Akabe Garric has been chosen as king, though he had not asked for kingship. Despite this, he decides to prove himself to be a worthy king and begins undertaking a major project: Rebuilding the Infinite’s temple in the land of Siphra. He quickly runs into a problem, that land is held by worshippers of another god and will only relinquish the land if Akabe marries their leader’s daughter. Intent on rebuilding the temple, Akabe agrees to the terms. Meanwhile, there have been numerous assassination attempts against the king, and the prophet Ela worries that the new queen may lead to the destruction of the new kingdom. Containing undertones from Solomon and Moses, King moves at a brisk pace. Whereas the previous two books jumped back and forth between Kien and Ela alone, this time around Akabe and his queen (Caitria) are strong supporting characters, though most of the time they are also present with Ela and Kien. As I’ve mentioned in my earlier reviews, I’ve never found Ela to be a strong character, as she mostly reacts to events around her, or reacts to the visions she receives. While I understand that a part of this is due to her role as a prophet, it also makes her boring. Akabe is a reluctant king, trying his best to lead his people, and I would’ve enjoyed reading more about his struggles as ruler. I also found that the humor was not present as much. In the first two books, the destroyers provided some needed comic relief, and that was not felt in this story. In fact, the destroyers barely showed up at all. At times, the story logic did not seem to make sense. Early in the story there are assassination attempts against the kind, and the power planning these is not fully known. Instead of being careful in his interactions he decides to marry someone he has never met from a country that has religious tensions with the king. While I get that he wanted the land for the temple, it seems strange that he never considered the risk involved either. In the end, King was probably the fastest paced of all of the stories and was helped by spending even more time with characters other than Kien and Ela. However, some strange story choices, and the lack of interest in Ela kept this from hitting even higher. 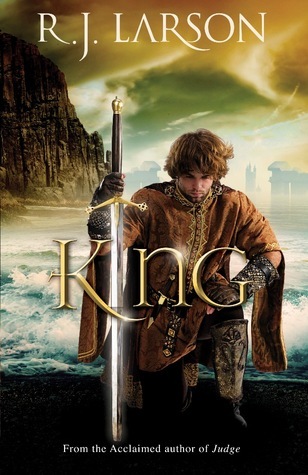 I have been extremely impressed by R.J. Larons's debut into the fantasy fiction realm, and I have enjoyed the entire series that is concluded with the wonderful novel "King". All of the characters I have come to love have returned in fine form in "King", a novel that pulled me into the story from the first few pages and didn't let me go until the satisfying conclusion. 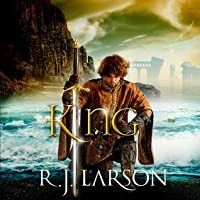 Larson has done a wonderful job at creating a believable fantasy world, complete with a map that will help you picture the world I have been extremely impressed by R.J. Larons's debut into the fantasy fiction realm, and I have enjoyed the entire series that is concluded with the wonderful novel "King". All of the characters I have come to love have returned in fine form in "King", a novel that pulled me into the story from the first few pages and didn't let me go until the satisfying conclusion. Larson has done a wonderful job at creating a believable fantasy world, complete with a map that will help you picture the world that the characters live in. The book is very well-written with vivid descriptions, interesting characterization, and unique elements that make the story special. I love the many creatures that Larson has created, especially the huge "destroyer" war horses that play such a big role in the stories. The scenes explode with action and drama, with elements of romance woven into the story as well. Although I have grown to care for all of the characters in the story, the prophet Ela continues to be my favourite, and I loved watching her as she embodied faith in action. "King" finds her at her best, faithfully following where the Infinite leads her, no matter what he has asked of her. Although this is a fiction book, I couldn't help but reflect on the way I talk with God and hear his voice, and I found myself longing to have the same type of intimate relationship that Ela displays. "King" brings all of the plot elements introduced in the first book full circle, and I have no doubt that other readers will be just as satisfied with the end of the book as I was. In fact, my only disappointment with this book was seeing it come to an end. I can absolutely promise that I will be going back and re-reading this entire series in the future, because it is probably one of my favourite series to come along in some time. I encourage readers who don't normally read fantasy fiction to give this book and the entire series a try. They will be thoroughly entertained and also find themselves pondering their own interactions with their infinite creator! 5 out of of 5 stars. I found King by R.J. Larson to be a compelling and palatable rendering of man’s continual struggle with obedience toward God verses pride-inspired goals. I found that Larson’s easy yet brilliant writing style propelled me into her world of danger, betrayal, and ultimate sacrifice. Let us heed this hard lesson that is lived out before our eyes and save ourselves the heartache and pain of experiencing it firsthand. It always amazes me how wise we think we are. 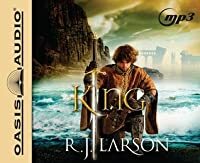 What we don’t realize is that our wisd I found King by R.J. Larson to be a compelling and palatable rendering of man’s continual struggle with obedience toward God verses pride-inspired goals. I found that Larson’s easy yet brilliant writing style propelled me into her world of danger, betrayal, and ultimate sacrifice. Let us heed this hard lesson that is lived out before our eyes and save ourselves the heartache and pain of experiencing it firsthand. It always amazes me how wise we think we are. What we don’t realize is that our wisdom is but filthy rags to the One who is wisdom. Our hearts are an open book to Him, so when we think we are hiding, we are merely a child who ducks behind the living room couch and yells out for someone to find him. We are mere dust, but yet He writes my name on His heart! This incomprehensible and infinite Creator of the Universe sees me for all of my short-comings and still loves me. Now, tell me how this makes sense?! No matter how many times I helplessly fall, and no matter how many times I purposely stumble, He is always there to pick me back up. He loving brushes me off, straightens my hair, kisses my forehead, and then tells me to try again. How can this be?! How can He the Almighty – the Alpha and Omega – watch me make the same endless mistakes and yet love me more each time? The only answer I have is that He loves me. He loves me so passionately and fervently that He sent His Son to die for me, so that I can spend eternity loving and adoring Him. Me – the one who fails all the time – is sought after by Him forever. This absolutely blows my mind. I will never be able to wrap my head around that, but thankfully I don’t have to. I just have to accept it. I just have to accept Him, His sacrifice, and His love for me. That’s it. That’s the only thing we have to do. I encourage you to do that right now and every day. Love Him as He loves you. R.J. Larson is the author of numerous devotionals featured in publications such as Women's Devotional Bible and Seasons of a Woman's Heart. She lives in Colorado Springs, Colorado, with her husband and their two sons. The Books of the Infinite series marks her debut in the fantasy genre. “Kien, talking with Akabe, caught Ela's glance and grinned, luring her thoughts toward him. Gorgeous man! How dare he distract her? Akabe backhanded Kien's shoulder. "Stop flirting with your wife and pay attention!" Kien shot him a mock-threatening look. "I am your servant, sir."